When flying in and out of Boston, I look at other airports at Hartford, Providence and Manchester and compare prices to Boston. Usually Southwest flights in and out of Hartford, Providence and Manchester are cheaper, less harried, less disgruntled TSA employees, and on time compared to Boston. The difference is flying into one of the three alternatives, I will have to rent a car and drive into Boston (hate driving in Boston), spend money on a rental car, drive on portions of I-95 (narrow lanes always under construction), spend money on parking the rental car over night in Boston which is about $30/night (most street parking is residents permit parking only) and spend about 1.5 hrs on the road, 3 hr round trip back to the far away airports. But the upswing with a rental car is that I can take day trips out of Boston to ME, NH, VT, RI and CT. Then there is flying into Boston which can be $ hundreds of dollars more for airline tix, but I can take the T out of the airport. The T takes about an hour to get out to Boston College area because there is the terminal bus, and then either the silver line-walk-green line, or terminal bus-blue line-long wait to green-line, and then there is a walk from the T station. A T week-long Charlie Pass is only $18, and I can go anywhere the T goes all week at one low price. The T does not go into ME, NH, VT, RI and CT, so my day trips are limited to a smaller of metro Boston. These are the factors I weighed when deciding on this trip to Boston. This trip it worked out that flying in and out of Hartford Bradley Airport was the most economical way to do it, and I had a car to go on day trips all over New England. If you fly like I fly, and decide to fly into Hartford and go into Boston, the rental car agent will offer an EZ-Pass rental. Take it. That best and fastest way in and out of Boston is on I-90 the toll road, and there are multiple toll plazas between Hartford and Boston. You don't have to stop, you don't have to have correct change, you can just zip on through. Everyone and toll authority are happier if you get and EZ-Pass. For me with my day trips out of Boston, I was going through toll gates left and right, so it worked out for me to rent the EZ-Pass. I got in fairly late into Bradley Airport after not eating all and a plane change in Baltimore. Any of you making a plane change in one our finest airports such as Baltimore, Dallas or OHare know you got a workout ahead of you and you just need to get to the connecting gate. Plus most of the food at these airports are bad, deep fried, or fast food, and I have become a woman of a certain age when bad fast food and greasy foods don't necessarily agree with my stomach. You read that, you don't want to sit next to me on a plane if I eat bad airport food. Anyway, on this trip, I did not have time to stop for food at the connecting airport, nor did I want the bad greasy fast food at the airport, so by the time I landed in Hartford, I was really hungry and wanting to eat dinner, and I still had to rent a car and get somewhere to eat. I wasn't going to wait to get into Boston because I was so hungry. Bradley is in a bit of a no-mans-land, and there isn't much around there. Hartford is about 30 min south and away from where I wanted to go, and once I get on the turnpike, I might as well wait until Boston. So, I quickly texted my old prom date pal and asked him if he know of a place to get dinner, preferred lobster near the airport. He said Maine Fish Market just one township over from Windsor Locks where the airport is. 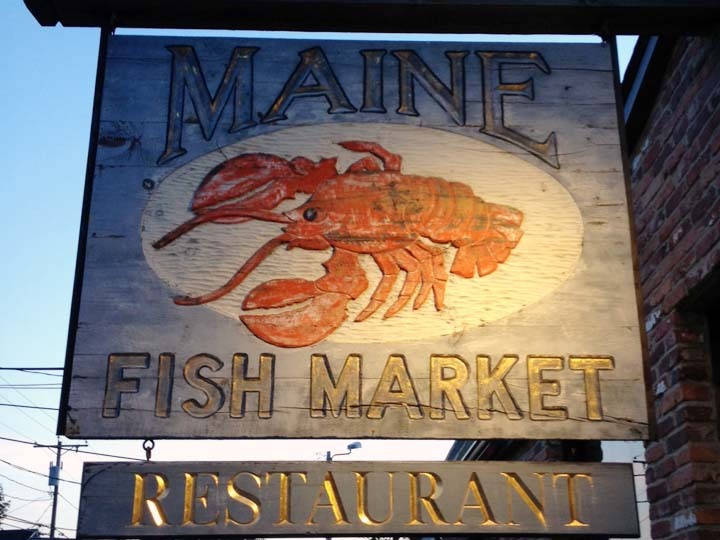 So off I went with Maine Fish Market in my phone GPS. 10 minutes east of the airport through an old mill and residential neighborhood, I was wondering where the heck I was going. There was not one sign of commerce. 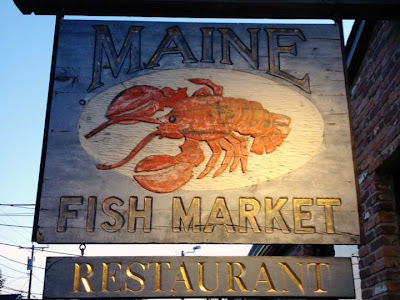 Then, at minute 11, there it was, an unassuming old building with a quaint sign saying Maine Fish Market Restaurant! I will never doubt the old prom date ever again. 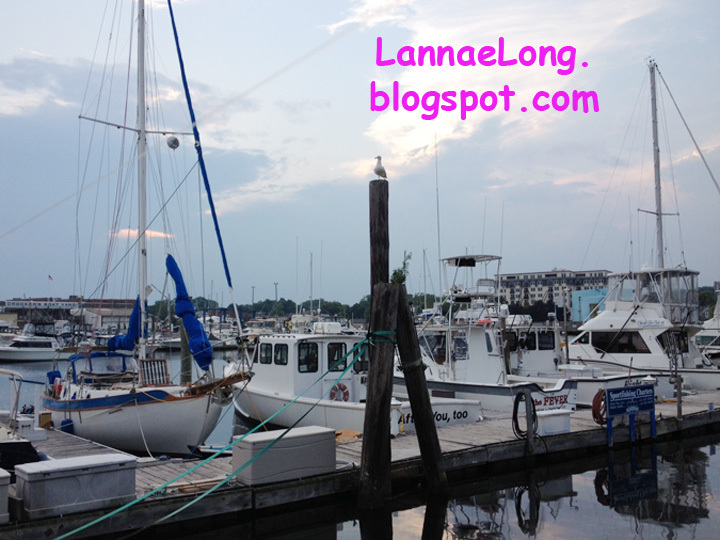 There was nothing else around the Maine Fish Market, so it was either do or die. I walk in, and this place was packed to the rafters with patrons happily eating seafood, and the restaurant itself looks like it could be right out of the 1970s. The waitress was a bit like Flo from Alice's, but she was quite knowledgeable about the menu, lobster, and caring for locals and tourists alike. I got myself my 1st lobster of this trip. Soup or salad and two sides came with my lobster for one fair price. The kitchen prepared the lobster correctly. It was so nice to be back in New England where seafood cooks actually know how to cook lobsters. Having spent my formative years in Boston, I know how to break down a lobster. When I first sat down, the waitress asked where I was from, and I told her I just got off a plane from Nashville. She was expecting me to struggle with the lobster, but I grew up with lobsters and I know how to break them down and get every last drop of meat out the critter. When I was done, and the waitress came to remove my dishes, she was amazed. She complimented me that I did a really great job breaking down the lobster and executing like a New England pro! First stop in New England was a success, and I was so happy to look forward to some awesome lobster meals to come. seating only, so be prepared if it is raining. While on vacation in New England, and after re-connecting a friendship with my old prom date, I went out to see the old prom date and family in Connecticut for dinner. This is a first for me to eat a nice dinner in Connecticut. I may be from Boston, but I did not get out much to other New England states while I lived there. Most people in the city do not have cars because it costs so much to keep one. The cost is insurance, and paying for a parking spot. Some parking spots along Commonwealth Ave and Beacon St cost about $500, 000. Yes, parking can cost more than most peoples 3 br/4ba with 2 car garage homes in the rest of the USA. It is not worth having a car with the T (subway/trolley), walking and Zipcars available. Anyway, living in Boston without a car meant that my world was as large as the T and commuter rail would go. This trip I got a rental car and was able to drive all over New England, and decided to drive down to New London to see my old prom date pal. It was so great to see my old prom date after they were just here in Nashville. Funny thing, the week I was on vacation in New England was the same week as the record high heat wave in New England and it was literally hotter and more humid in New England than it was in Nashville, which is usually always hot and humid in the summer. The old prom date has lived in Connecticut for many moons, and informed me of the Connecticut traditional Hot Lobster Roll. I have never heard of this before because I never lived in Connecticut. A traditional Maine and Boston lobster roll is cold lobster meat mixed with mayo on a hot dog bun. A Connecticut Hot Lobster Roll is hot lobster meat drizzled with hot butter and put in a hot dog bun. Bring it on! I love that idea! And the old prom date also explained what a Rhode Island clam chowder is, and it is a clam broth steeped with onion and bacon and served with chopped clams and potatoes. New London is fairly close to the Rhode Island border, so there is some cross over in regional specialties. The old prom date said I must try the Connecticut Hot Lobster Roll and the Rhode Island Clam Chowder. After I arrived in Connecticut, off we went across town to the best New London lobster shack, The Captain Scott's Lobster Dock. So, there was a big parking lot fairly full, a line of about 20 people long to order food, and many people sitting with their lobster rolls at the many picnic tables. We parked the car and became the back of the ordering line. As we moved up in the ordering line, people at the picnic tables finished up and left with new people picking up their orders to sit down. 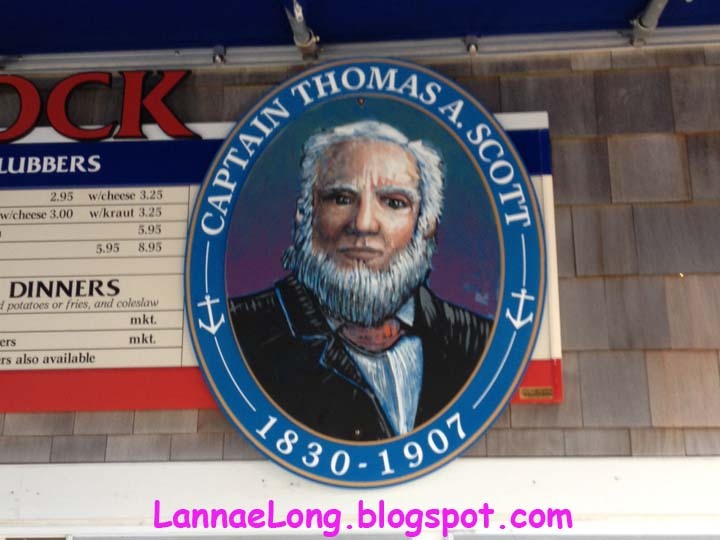 As we approached the lobster shack window, I turned around, and there were about 20 people behind me. This went on for the hour or so while we dined, the line never got shorter, and the tables were always at the same level of fullness, and the through put was sustained. I got the Connecticut speciality Hot Lobster Roll and the Rhode Island specialty Rhode Island Clam Chowder. 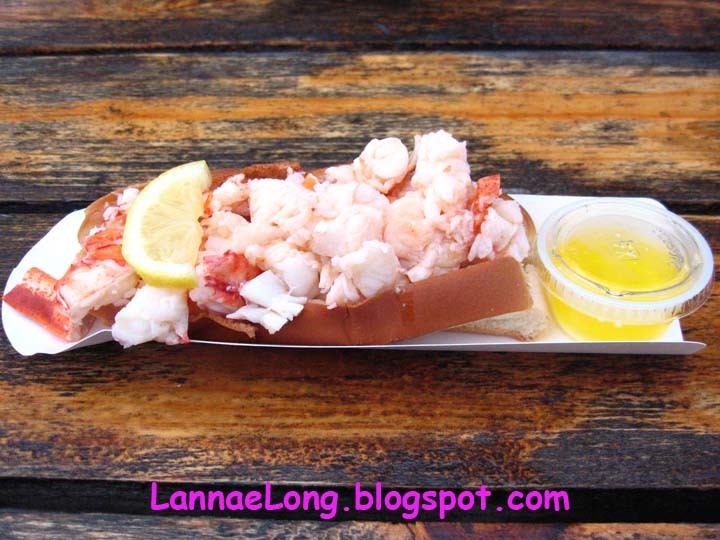 The Connecticut Hot Lobster Roll is simply a whole small lobster chopped and piled onto a hot dog bun with butter. There is no Old Bay, not salt, no pepper, no nothing, just pure lobster and butter, and this simplicity is the perfect way to eat lobster. This is so dang good. I really will never eat another cold mayo lobster roll ever again. I am a total Connecticut Hot Lobster Roll convert. I also liked the Rhode Island Clam Chowder as it was a nice light broth based soup. I still like the New England Clam Chowder better, but sometimes I am not in the mood for a heavy cream based soup like New England Clam. Up to this point in time, I equated chowder with a heavy cream based soup, except for New York style clam chowder which is a brothy tomato soup. But, because my old prom date is a fairly accomplished home cook and has traveled the world including France multiple times, he told me that chowder is actually a reference to a chaudiere in French (latin root) which is a stew pot. As it became a USA thing, chowder still refers to a stew pot, and the stew pot is filled with fish or shell fish stew/chowder. I will repeat again, this is a cash only place. CASH ONLY. Go get green back. Get those yuppie food stamps out of the ATM before going to order your large hot lobster roll. PSA - When in Boston, you will want to eat two types of food - Italian in the North End, and seafood, and you can do both in one stop at The Daily Catch in the North End. The Daily Catch does not take reservations, so if you go at lunch go at 10:57 a.m. to beat the crowds, and if you are going for dinner, go at 4:25 p.m. to beat the crowds. If you don't go at these times, you will face an hour+ wait. There is no place to wait inside, so you will be waiting on the sidewalk with others, no matter what the weather is. And, don't get mad about the wait, everyone else is in the same boat, all the locals know the gig about the wait and are patient, and you will be rewarded to wait it out with really delicious seafood and North End Italian food. I am breaking the unspoken code of silence amongst the Boston locals with regards to the Daily Catch. There is a whole thing about the Daily Catch. Every local knows about it, adores it, and wants to keep it a secret, in hopes that will keep the wait line shorter. So, during my vacation visiting the family up in Boston, I got to talking with my old buddies who are still in the Boston area. I conducted a little test. Since I have not lived in Boston in over a decade, I asked my old buddies where there was a great place to get a great meal with seafood. 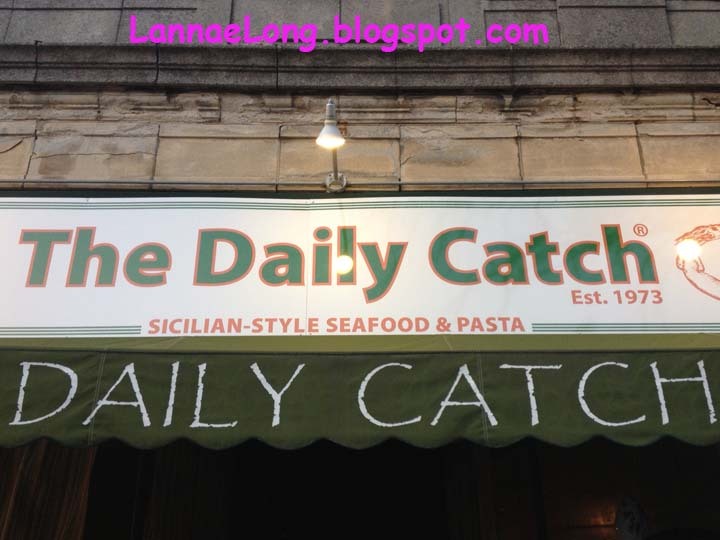 They said all the standards like Legal's, Union Oyster, and Durgin Park, but not one said the Daily Catch. Then, I said, what about the Daily Catch, and I got the momentary frown micro-expression of, "Oh crap! She knows about the Daily Catch, there is now another one who will be waiting in line too, and there are only 6 tables inside, and they don't take reservations." Then they all gave the admission of, "Yes, it is one of favorite restaurants, you gotta go early and get the black squid ink pasta aglio olio, which is so good!" I am sorry my Boston friends, I let the secret out of the bag. So on this trip, I did not go to any other restaurant in the North End besides the Daily Catch. Believe me, you cannot go wrong with any restaurant in the North End, they are all good. No kidding, ALL of the restaurants in the North End are good, they would not survive otherwise. The North End restaurant scene has always been this way for as long as I have known about the North End in the 1970s to present. When anyone in TN ever asks me about where to eat in Boston, I say the North End, pick one and you will be delighted. My TN friends are always skeptical when I say this pre-trip, but post-trip when they come back, they always admit I am right. All the places they dined at in the North End are superb. Yes, if you go to Boston, and are into food, you must go try at least one restaurant in the North End. On this trip, I got the squid scampi and the black squid ink pasta aglio olio. The squid scampi was lemony and buttery. I liked it. 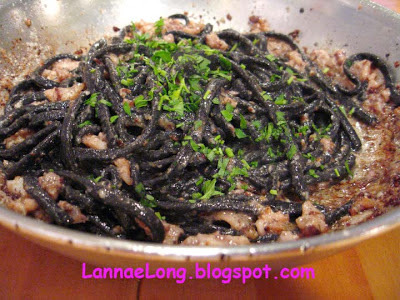 Then I got the dish all my friends talk about, the black squid ink pasta aglio olio. The dish is house made squid ink pasta which uses a great deal of squid ink. The pasta tastes slightly lemony and briny from the squid ink, and is so good. I have tasted other squid ink pasta where there wasn't too much ink used, and was only for color, and I did not get the tart and brine flavor I got from the Daily Catch pasta. I got the aglio olio which means pasta and oil. The Daily Catch serves aglio olio black squid ink pasta with ground squid, garlic, olive oil and S&P. Very simple ingredient list, but such an amazing seafood flavor. This dish is probably in my top 10 favorite dishes of all time. One thing you should note about the finished dish presentation, the pasta and sauteed dishes are served in fry pan and plopped on the heavy wood dining table. The pan is your dish. Don't get mad, it is how it is for everyone, tourist and local. You really want to have the whole pan so you can scrape up the yummy brown bits at the bottom of the pan which adds so much flavor to the overall dish. Friends have said they have seen from time to time there are "first and last time" snooty restaurant go-ers who get mad at the whole fry pan serving dish and vow never to come back. My friends cheer silently while thinking there is less competition to get in now, and those snooty people are missing out. Seriously, the food is really good, and I don't care what pan or plate it is served on, and I too am happy to have the snooty people not come back. I can't afford another vacation to Boston any time soon because I have been caught up on the sequester furlough B.S. Congress and Senate have imposed on me and many others. 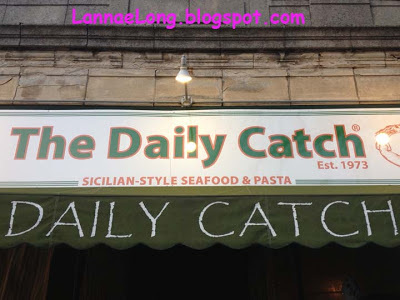 But, when I can save some pennies, and can afford to get back up to Boston, I am already planning the playbook and when I visit the Daily Catch again. Next time, I will likely keep my visit hush-hush and go back to the code of silence so I don't have to wait so long to get in and get another serving of the black squid ink pasta aglio olio. PSA - if you go to Warren's this month of July, get on Warren's website and get yourself a coupon for $10 off $30 or more mid-week, and $5 off $25 or more on the weekends. You can take up to 3 coupons per table. Now that is a good deal. 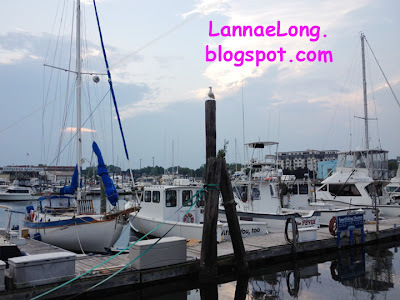 After a long day of shopping the outlets in Kittery, Warren's is a welcome R&R restaurant on the water. Warren's is a nice Maine lobster "shack" restaurant. The "Finest Sea Coast Salad Bar" comes with each meal. I chuckled at those words until I saw the salad and soup bar, and it is really a great salad and soup bar. There is every type of salad green and every type of salad topping you could possibly want. The soup bar was also nice. On this day it was house made pea soup which I adore. I love peas soup, and this one was nice with little chunks of peas. The best part was house made pumpkin bread on a platter next to the pea soup. It was just the right spice, sweet and moistness. Besides the lobster, the pumpkin bread was the big hit of the evening. And we lucked out with a really nice waitress. She is a young lady who reminds me of my pet-sitter, who we adore. Our waitress represented very well - the hard working salt-of-the-Earth nature of the people of Maine. Kittery, ME is only an hour drive north on I-95 from Boston, and is the center of all outlet shopping needs. Kittery is a good day trip from Boston if you want to do some factory outlet shopping. Kittery outlets are really quite old, and the outlets supported and still supports the textile industry that used to be and still is located up and down the Massachusetts coast, Southern New Hampshire and Southern Maine. Many Kittery factory outlets are truly factory outlets, and not like those new "factory malls" that have popped up everywhere in the USA. 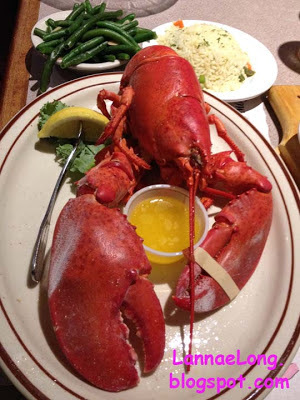 On this day, after we walked around all day long in Kittery, we sat down and used our smart phones to look up Yelp, Urbanspoon and Trip Advisor for a good lobster shack in the area. This is different from the last time I was in Kittery because last time I was there, it was way before smart phones. The last time I was in Kittery, I was with an old bf. Before we went, his roommate at the time gave us the 411 on how to drive there, where to park, and where to eat. This time around, we used our GPS on the smart phone to get there and back, and used the smart phone to look for a place to park, and a place to dine. Anyway, after looking around these websites, Warren's Lobster House fulfilled our wants - lobster, clams, on the water, and fair prices. Warren's delivered my need for lobster and clams, and lobster and clams sourced locally. 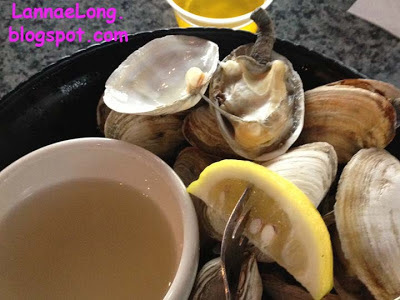 The nice young lady waitress actually knew what Maine coastal towns the clams and lobsters came from, but I forget what she said now that I am home typing this blog post (CRS). The clams were not sandy at all. I got them steamed, and and they were served correctly with clam broth to rinse the clams before I ate them. The clams were cooked perfectly, so the clams were just opened. It has been a long time since I ate clams so fresh and close to the source. 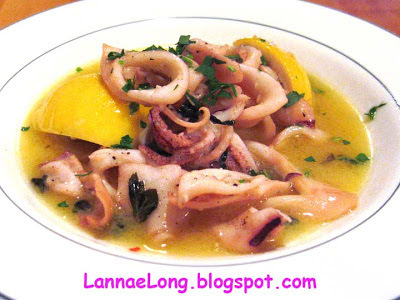 These clams were slightly sweet because of their freshness. And the lobster was so good and also prepared and served correctly. I asked for a female lobster because I do like the roe, and Warren's lobster cooks know how to do that. Female lobsters have a wider tail and their first pinchers on the tail are flexible, where males are stiff. The lobster came out perfectly steamed, not overly steamed. The cooks did not pre-crack the lobster, which is the correct way to do it, so the moisture inside the shells keeps the meat warm and moist while I tackle the other parts of the lobster. 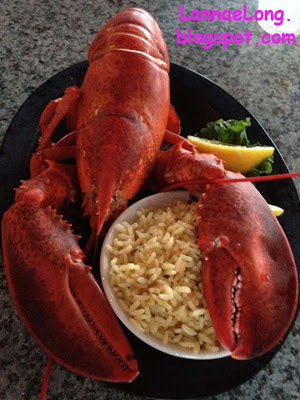 I love lobster, and I can't believe that lobster used to be "trash" food in the 1700s, when people ate lobsters only because they were desperate for food. Now, people like me, seek to have lobster and consider it a delicacy. This was a good day in Kittery, ME. As we stepped out of Warren's and got into the car, it started to sprinkle rain. We lucked out. We were walking in and out of buildings all day long, and it slightly overcast and a perfect New England summer day. As we headed south back to Boston, the rain cleared up fairly quickly as the rain moved north and us south. We were very happy with our day in Kittery, ME.